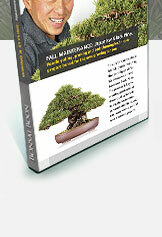 This DVD features Boon Manakitivipart teaching the techniques of Fall Maintenance on two Japanese Black Pines. Needle-pulling, pruning and bud-thinning techniques prepare bonsai for the new growing season.These techniques allow sunlight and air into a tree's interior, promoting new growth and stimulating back-budding. The process is key to creating professional, show-quality bonsai. Using these methods, you can learn how to control next season's growth. International customers: PAL DVDs are no longer available for this title. Email if you would like to order NTSC format at video@bonsaiboon.com.